Issued September 13, 1994, to Heartbeat Corp.
An exercise device, such as a exercise bicycle, is connected to a speed sensor indicating activity level, e.g. speed of the bicycle. 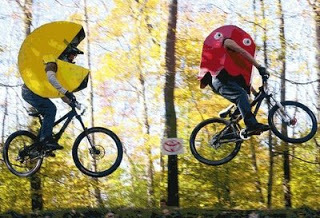 The activity level signal, along with a heart rate signal, are provided to a video game, such as a Pac-man type video game. 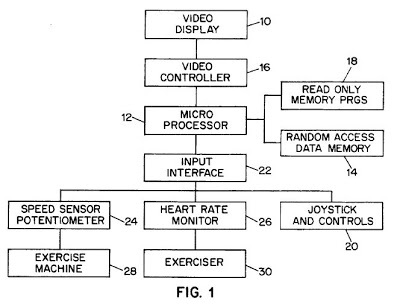 The game monitors the heart rate of the exerciser. If the heart rate falls outside preset minimum or maximum limits, a certain action occurs in the game, such as an increase in speed or skill level of the opposition. In the Pac-man type game for example, should the heart rate fall below the desired workout rate, the villain (the goblin) would move at a speed faster than the players’ speed, putting the player at a disadvantage. The player would respond by increasing his level of physical activity, thereby increasing the heart rate until it exceeds the minimum aerobic level required, at which time the villain’s speed would return to its normal level. Appeal: Secure Axcess, LLC. v. Nintendo of America Inc.